Walking On Broken Glass Music Video screen shot, June 12, 2010. (Wikipedia). Qualifies as fair use under US Copyright laws because of low resolution and indirect reference. Three days after my seventh birthday — which also happens to be thirty-five years ago on this date — I witnessed one of the most bizarre and frightening things a kid should ever see with two parents in the midst of a divorce. It involved infidelity, jealousy, vindictiveness and violence. But the incident itself was part of a domestic situation that had been spiraling out of control for at least two years. 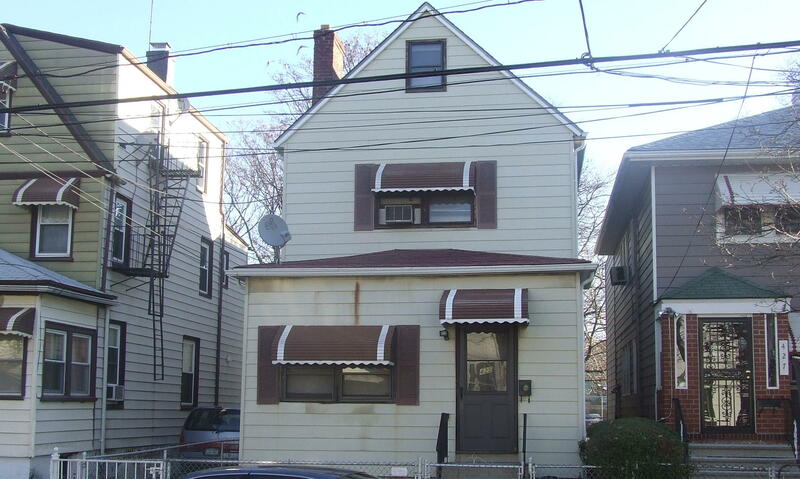 425 South 6th Avenue, Mount Vernon, NY, November 22, 2006. (Donald Earl Collins). to the police (cut off by my folks mid-call). Things like finding him face-down in a pile of freshly cooked greens and chitlins and falling asleep on the Metro-North on Bicentennial Day with me and Darren in tow and ending up in New Haven, Connecticut didn’t help matters. The fall after the divorce filing, me and my older brother Darren found ourselves in a strange limbo. Jimme hadn’t moved out, but was out drinking so much that seeing him at home was a random occurrence. My mother was home — sometimes — with Wednesday evenings reserved for bowling nights and occasional other nights out that weren’t easily explained except by my father’s accusations of cheating. By October ’76, whenever Jimme was home, he found some way to get back at my mother. He put about $3,000 worth of my mother’s clothes and shoes into a bathtub full of hot water (about $10,000 in 2011 dollars). Me and my older brother Darren were there when he threw a brand-new thirteen-inch Sanyo color TV out of our second-floor window, this right around Halloween. Jimme also had repeatedly cut up the new furniture my mother had bought after filing for divorce. My father’s drunken awareness of my mother’s new relationship with my eventual idiot stepfather Maurice led to a nasty incident that topped all of these, if only because I was wide awake for this one. My mother decided that it was time for us to finally meet the mystery man who had been in her life for the past several months, Maurice Washington. So for the first time in three days, we all gathered at 425, all to have a fried chicken dinner. 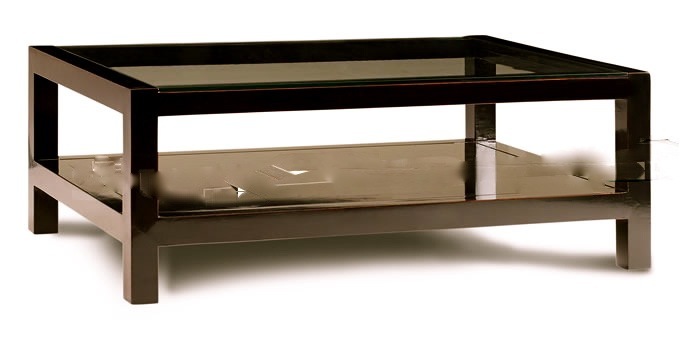 Two-layered tinted glass coffee table, similar to one my mother bought in 1976, December 30, 2011. Jimme came home to bear witness to this gathering, and drunk as usual, flew into a rage. He started throwing food from the kitchen, then walked into the living room. There, with me and Darren sitting on the couch and Maurice and my mother watching, Jimme destroyed a glass-topped coffee table by stomping it in. Shards of glass were everywhere, including small bits in my father’s legs. He bled everywhere it seemed. I found myself hiding between the Christmas tree and the stairwell that led downstairs to the front door. Soon an ambulance and the police came — once again — to take Jimme to the hospital. This was more than my mother could bear. She ended up in Mount Vernon Hospital for almost two months with a serious kidney ailment that turned out to be stress-induced. Darren and I stayed with our usual babysitter, one of my father’s drinking buddies in Ida. By the time my mother came out of the hospital, which was in April ’77, Maurice and my Uncle Sam had moved us into an apartment at 616 East Lincoln Avenue on Mount Vernon’s North Side. But not before my Uncle Sam, a big man at six-foot-four and about 230 pounds, clotheslined Jimme over a fence in front of our old place as an act of vengeance. Me and Darren were there because my father had swept us up from our babysitter’s place on East Third Street and taken us to 425 to hang out for a few days, which meant us missing school as well. He’d managed not to drink for those two and a half days, and even made us lunch and dinner consisting of Kool-Aid, meatloaf, mac and cheese and string beans. While Jimme went out to buy us some soda, my Uncle Sam and my soon-to-be-stepfather had come with the moving van. About a half-hour later, there was Jimme, about to walk through the gate into the front yard. The whole Deacon Jones-esque tackle seemed as if it were in slow motion, as I watched the 32-oz. glass bottle of Pepsi bounce twice on the sidewalk before landing in the grass, with only minor damage. The paper bag having landed right next to the front gate. And Jimme flipped backwards in the air, landing with a giant thud on the public sidewalk. I was traumatized, to say the least. My grades throughout second grade reflected that, not that Ms. Hirsch and her low-expectations behind would’ve noticed. The fact that I no longer had any continuity in my life made it hard to want to be friends with anyone, a complete 180 degree turn from what I’d been like in first grade. Again, no one noticed. And Darren had also withdrawn, finding in The Clear View School something he didn’t have at home.